For the nomadic Masai cattle is the most valuable and important thing they own. Traditionally, they don't grow crops or even do much hunting. They entire way of life revolves around their herds of cattle. The Masai get nearly all of their food from their herds of cattle, in the form of either milk or meat. Though they do drink the blood as well, it's not really something that's done as a regular meal-time event. They generally don't hunt or grow their own crops. The cattle are literally their bread and butter. In each village, the cows are protected and herded by the men, but the milking is done by the women. Because of their importance, the Masai use cattle as their form of currency and wealth. 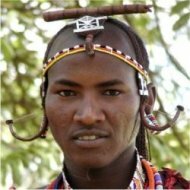 On average, each individual of the Masai tribe owns around 15 head of cattle, which makes these people among the wealthiest in Kenya, if a dollar value was placed on their herds. Cattle change hands for any major transaction, specifically when a warrior seeks to marry. He must pay a bride price in cattle. According to the legends of the Masai, their cattle were given to them by their god and therefore are considered property of the Masai tribe. In the past, this idea led to a lot of cattle poaching from surrounding tribes and ranches. After all, what harm is there taking back something that was theirs in the first place? Today, the practice of cattle theft has pretty much come to an end. But after generations of stealing cattle from other tribes, the Masai cattle are not strictly one particular breed. Their cows are quite a mixed bag. Along with their herds of prized cows, the Masai also keep other livestock, like goats and sheep. The Masai are very observant with their cows and can recognize each one by their colour and body shape. Some groups use cuts on the cows' ears to help identify them. The herds of cattle require large amounts of land in order to get the pasture and water that they need. Once, the Masai territory spread all through the Great Rift Valley region of Kenya and Tanzania. Since the late 1800s, their numbers have shrunk due to drought and small pox epidemics. 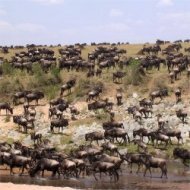 Large chunks of their land were taken by the Kenyan government to create large game preserves, such as the Nairobi National Park, the Masai Mara game preserve, and the Serengeti National Park. So with less land, the Masai have less room to roam their cattle.